Black racer snake photo by Steve Selwood on Flickr (noncommercial use permitted with attribution / share alike). 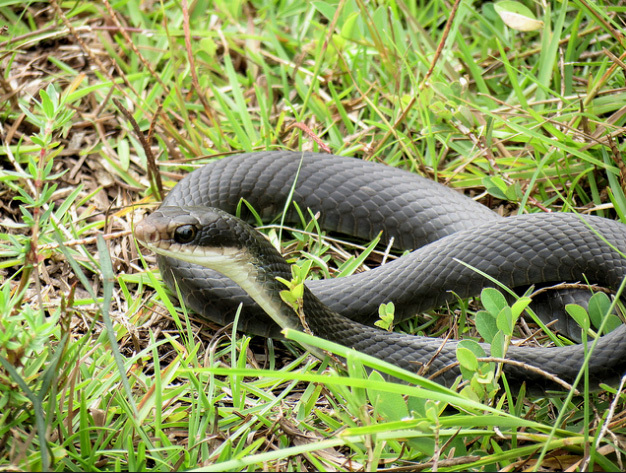 The black racer has smooth scales with a white or gray chin, throat and jaw. The belly is usually dark (gray, bluish, or black) from the throat back. The smooth scales give this snake a silky or satin-like appearance. A juvenile black racer is gray with large brown, black or reddish blotches down the back, small spots along the sides and large dark eyes. This pattern fades with age, disappearing when the snake reaches 25-30 inches in length. Black racers mate in the spring, and females deposit 10-12 eggs in small mammal burrows, under rocks or logs, or in mulch piles or rotting logs. Eggs laid in June or July normally hatch in August or September. Small mammals, other snakes, and insects are the black racer's preferred food, but racers take a wide variety of prey. They will even feed on young black racers. Active primarily during the day, racers are commonly seen as they bask on shrubs, rocks, ledges and roads, and are tolerant of summer temperatures that would drive other snakes to seek shelter. Black racers are very fast and typically flee from danger, but if cornered will put up a vigorous fight, biting hard and often. Rattling its tail among dry leaves, a black racer can sound much like a rattlesnake. If captured they are difficult to handle and will writhe, defecate and spray musk in an attempt to escape. Snakes; A Guide (PDF): MA Dept. Natural Resources & Env. Cons.